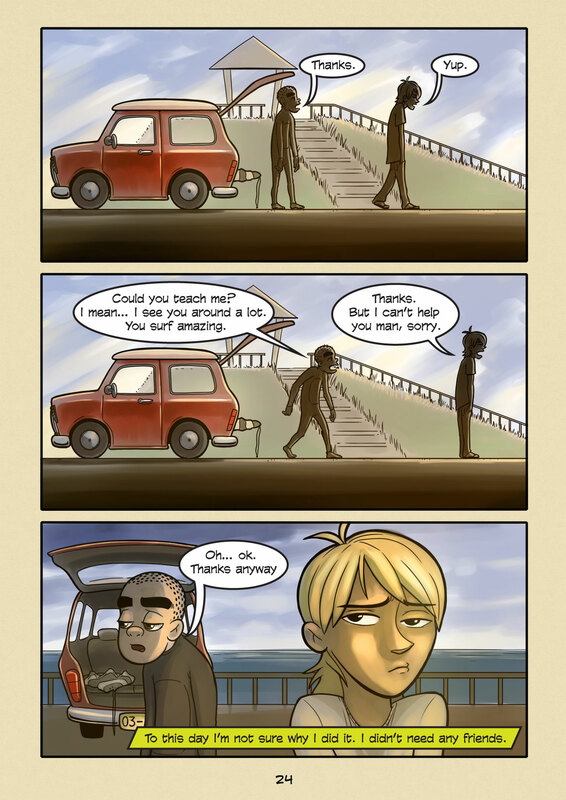 Cute Car (#024) | Web comic "Surfer Joe"
1. The boards they ride. 2. The cars they drive. First impressions are often regarded with high importance, and the appearance you choose is a huge factor. People in the business world dress themselves up in monkey suits and carry around briefcases in order to show others that they are responsible, capable team players. Punk rockers wear studs, pierce themselves in strange places and do crazy stuff with their hair to show they are anti establishment and could care less what you think. The point is that I think all characters in Surfer Joe need to be approached by 3 angles visually. 1. Appearance. This includes the type of wetsuit they wear as well as street fashion they choose when they are out of the water. As well as any special markings, tattoos, piercings, etc. 2. Surfboard. They surfboard they choose can reflect a lot about their personality. High performance short boards reflect a sense of athleticism and add a little “Jock” to the character. This also associates a higher sense of daredevil-ism. Long boards are the most laid back of surfboard options, they say you do things at your own pace. Fish boards are somewhere in the middle. They say you’re just here to have fun, but can throw down some performance moves if you want to. 3. Car. Do they drive an old beater? Of something higher class like a BMW or Mercedes? Or maybe a big SUV… or maybe a minivan with a baby seat in the back. Hard top or convertible? Stickers or no? I surfer’s car says a lot about their commitment to the art. Now what makes all this interesting for me personally, is that all these things don’t reflect the person so much as how they want to appear to others. People make these decisions for all kinds or interesting reasons, and it’s these reasons that I think make for interesting characters. So why does Joe drive such a cute car? I don’t know… because he likes it maybe? I think it shows he’s not from the surfing world, which in an odd way makes his intentions pure. What do you think?